A value priced alternative loaded to a certain specification that makes it a robust alternative to many other value priced target shooting alternatives. You can expect decent accuracy and fantastic pricing for this round and the reliability and consistency is better than most of what you will find at this price point from any maker. This is a “Ball M80” 147 grain full metal jacket projectile based load. 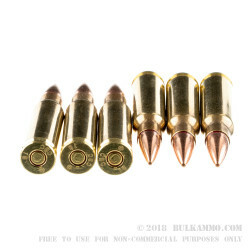 It has a stout powder charge and the round is reloadable for those who prefer to get more lasting value from their military style ammunition purchase. 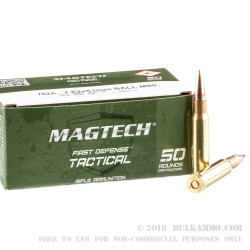 This is a 50 round box priced very competitively considering it can achieve sub 2MOA and reliably will hit the 1.25MOA threshold in most guns that are built for accuracy. This makes it a very solid choice for plinking and basic range ammunition. The copper clad full metal jacket projectile offers excellent target performance and keeps costs low with the versatile 147 grain weight. The Boxer primer and Brass makeup of the case ensures easy reloading. 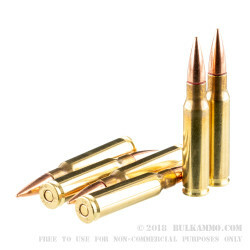 CBC offers this ammunition as a directly American Market product that proves the company’s capacity for quality ammunition. CBC is among the largest conglomerate ammunition producers in the world housing the Sellier & Bellot brand, the MEN brand, the CBC brand and MagTech. Q: Does bullet contain steel core? A: Hello Ken! This ammunition features a lead core, copper jacket projectile. There is no steel in the core of this projectile at all. 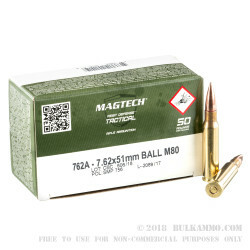 A: Magtech loads this 7.62x51mm ammo with boxer primed brass which may be recovered for the reloading process. All components are non corrosive.